"The bacchante... offered the cherished opportunity to display young girls with few, or no clothes on, while invoking the semireligious sanction of antiquity. Cassatt, painting in Parma under the clear eye of Correggio, did not succumb to the temptation of easy eroticism. Her bacchante is immediately a real person. 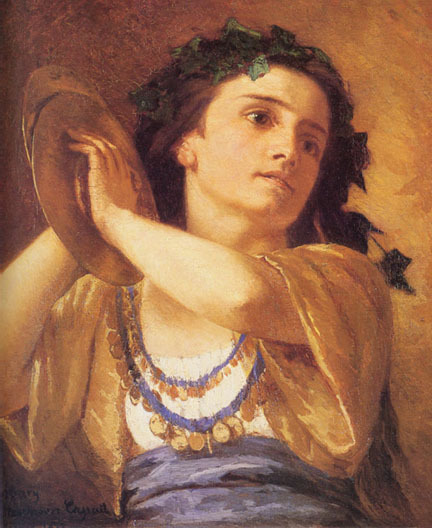 The vine leaves in her hair are underplayed, the cymbals are more than props, they are closely observed in their well-used, slightly battered state. The dancer's fixed intensity of expression reveals well enough the transport sought by the wine-god's devotees. Cassatt herself emerges in the powerful instinct for the bones beneath the flesh and for the flesh in light and shade." MORE BACCHANTE IMAGES by other artists.